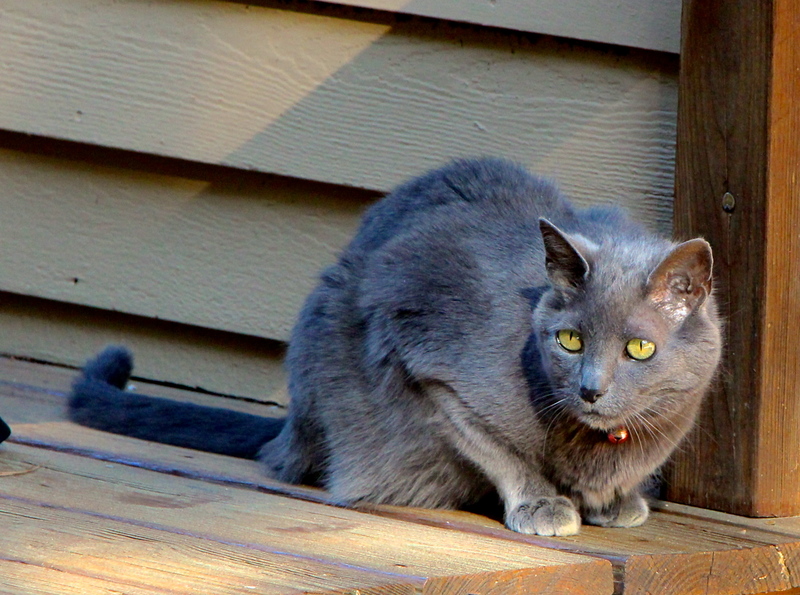 Coffee in hand, I stepped outside today to greet the morning sun with Maggie, our aged cat who has yet to leave the deck in our new place. Cool temperatures awaited us, real sweater weather! We always check on the birds, chase away the squirrels, check the blooms and blossoms, and see what insects might have visited during the night. The usual insect suspects were here and there around the deck but a couple of neat ones caught my eye. One tiny guy crawled slowly across the pollen-laden table looking like it had been sprinkled with fairy dust. Click on it for a closer look at the overnight pollen. It is an American Carrion Beetle (Necrophila americana), found east of the Rocky Mountains. Perhaps you have seen this small insect on dead animals. 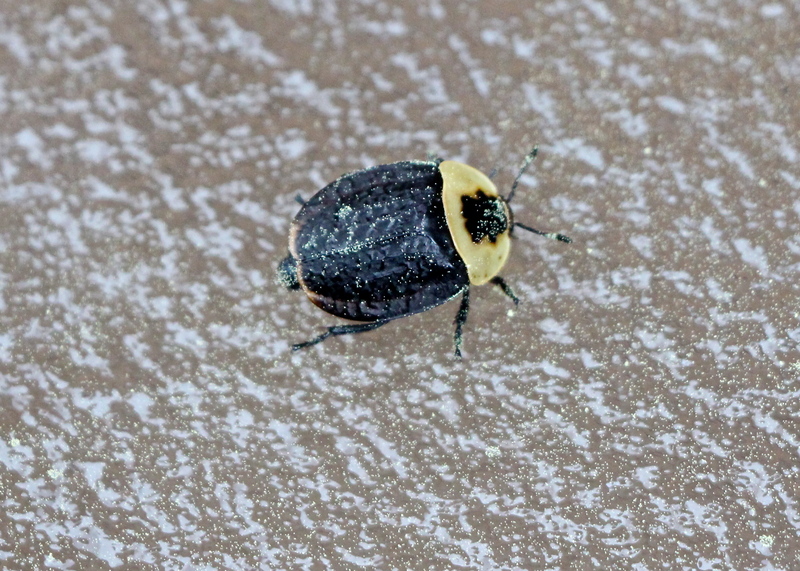 It’s a beneficial beetle that not only eats the flesh of a decaying animal, it eats its main competitors, those icky maggots. They have another clever little trick to help their survival. Tiny mites that also love to dine on the competition hitch a ride on the beetles from carcass to carcass, hop off and pig out on maggots. 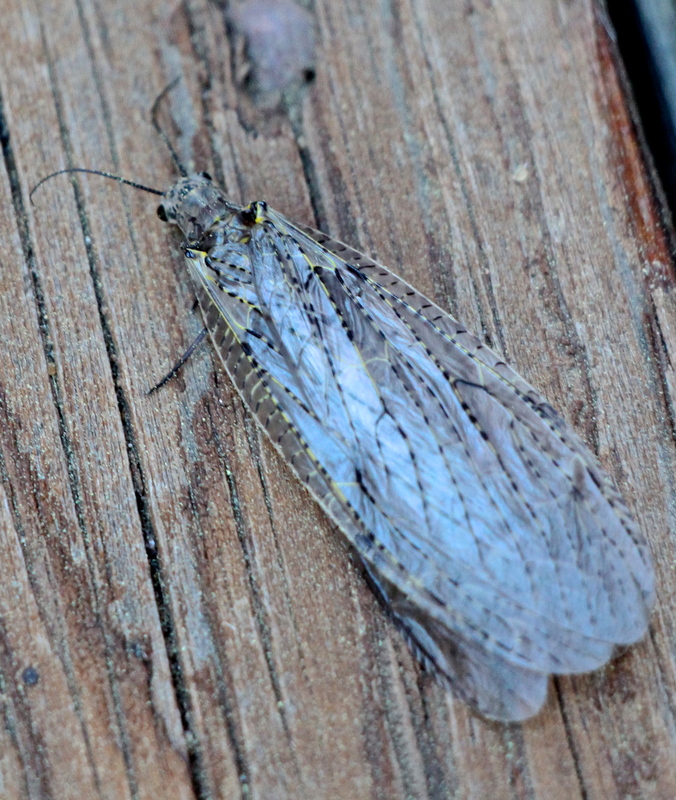 The rather odd insect (below) resting on the deck was as big as a dragonfly… nearly 2″ in length. It’s an adult Spring Fishfly (Chauliodes rastricornis), sort of a scary looking bugger. This one is a female. The males have feathery antennae. They are found near water since they lay eggs on the edge on leaves, etc. The larvae live in the water for 2-3 years. Yes, I did see larvae in my Virginia pond eating vegetation and an occasional tadpole. This female is said to not eat but will live and mate and lay eggs and die in a week’s time. This gal was looking a little sluggish….